With increasing pressure on businesses to improve performance and raise competitiveness, Industrial applications are under the microscope like never before. Our proven portfolio of Specialized Services can help you achieve these challenging objectives. 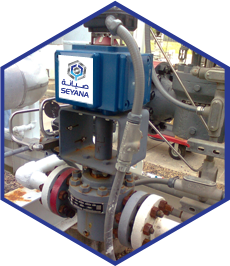 Seyana delivers fast, more cost-effective and quality work for required services by clients. 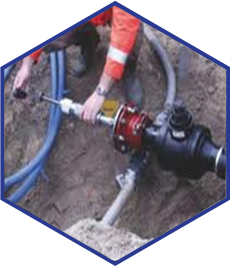 Technique for connecting to Piping or Vessels, while existing system is operating under pressure. Economical and lower Maintenance cost. 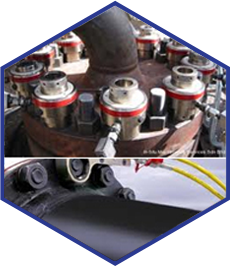 Extremely effective process for removing the hardest coke & scale from furnace tubes. Malfunctioning valves lead to increased maintenance repairs cost and overall inefficient plant operation. 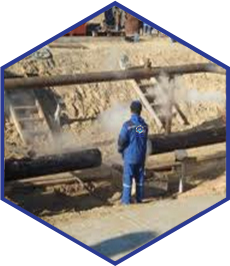 Our portable machine tools allow us to drive or fly into most locations to perform In-Situ Machining services such as Flange Facing, Portable Milling, Line Boring, Stud Removal, Pipe Cold Cutting, Boring Applications, Pipe Beveling, In-Line Valve Repair, Portable Milling, Bolt Torquing, Journal Turning etc. Provides simple & safe method for ensuring controlled tightening and loosening of bolts. Wrenches able to accommodate torque load of 80,000 Ft - Lbs.